Second Chance Pet Network is a not-for-profit organization. We rely on the generous donations from the citizens of Dryden and surrounding area. Donations are gratefully accepted, with charitable receipts provided for all cash donations of $20 or more. Second Chance Pet Network is a registered charity, #85116 7858 RR0001. 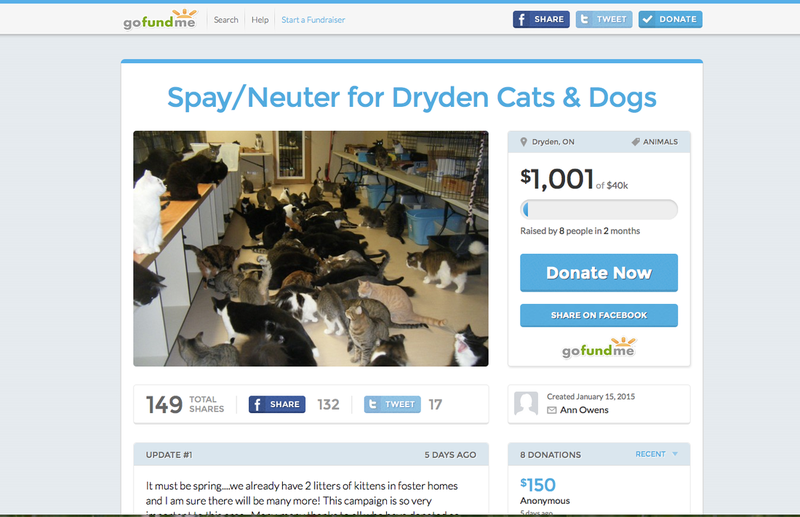 We have set up a GoFundMe account to raise money for our low cost spay/neuter program. Click here for the link. Choose a pet in care, and for as little as $ 10 a month (for $120 per year), you can help to subsidize the care of the animal. Check out our Sponsors page to see our sponsored cats as well as our corporate sponsors. Donations in memory of a human or an animal may be made with Second Chance Pet Network as the recipient. This may be done at a funeral home for a person by designating Second Chance Pet Network as the recipient of the donation in the memory of the deceased. Donations may also be made at the shelter located at 270 Wilson Rd., Oxdrift, ON in memory of either a deceased person or an animal friend. Donate $25.00 or any amount you wish and you are honoring the memory of a special person or animal and helping SCPN raise much needed funds at the same time. If the deceased was an animal lover, then they would truly be honored by a donation to SCPN in their memory. Many people prefer monetary donations in their memory to flowers at their funeral or memorial as well, seeing this as something that is “put to good use”. Our storefront called “Second Chance Treasures” at 24 King Street. Second Chance Treasures accepts donations of gently used items. (No clothing please! ).